at the beautiful Scotsdale Golf Course. An estimated 600 attended! The BVGC President's Theme was: "Let's put the beauty back in Bella" and we wanted to share our progress and vision with everyone. Tickets allowed attendees to enjoy appetizers prepared by our wonderful and creative members, wine, refreshing waters, tea, live music, art created by our talented local artists, sculptures and photographers. 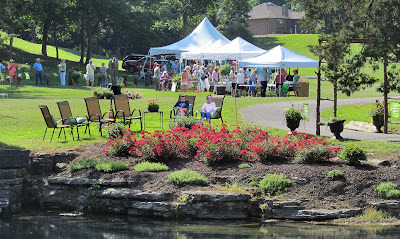 The location was at the lovely landscaped pond by the 18th green of Scotsdale Golf Course and parking was available at the club house and at the golf cart parking lot. Attendees were brought to the event and returned to the parking areas by golf cart. Both the City of Bella Vista and the Bella Vista Property Owners Association had tents with representatives to share how they are helping to make Bella Vista a more beautiful place to live and enjoy. 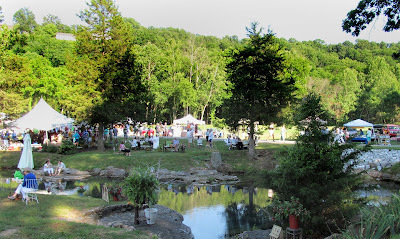 There was a silent auction, the Club's Garden Boutique, over 35 booths where attendees could purchase various types of unique art and sculptures. Benton County Master Gardeners and our members had gardening information and floral design hints. This fund raiser helped us support our Dorothy Wallace Bella Vista Garden Club Scholarship program for local horticulture students, Arbor Day plantings, Garden Therapy at local health care facilities, Audubon contest for local school aged children, the "Bella Vista Gardening" TV program produced with the Bella Vista Community Television station, our planting and gardening projects at the Veterans Wall of Honor, the Blue Star Memorial/Highway 71 Welcome Center and the Bella Vista Memorial Garden Cemetery. Tickets were available for a $10 suggested donation before the event or at the Garden Party on June 10th at Scotsdale Golf Course for a suggested donation of $12. I would like to thank EVERYONE, but especially the Garden Club Committee and all the Garden Club volunteers that rallied together to make it all happen – food tent workers, garden layout workers and those that lent items to set the stage, the tireless golf cart drivers, the club members who made all the delicious food, and so many others. The Bella Vista Garden Club is an enthusiastic group who are doing everything in their power to keep Bella Vista Beautiful. Big shout out to the Bella Vista POA for furnishing the beautiful site and especially to Tommy Lee, Director of Business Development for all the extras including tents, power, ice, facilities, use of the golf carts, and so many other things too numerous to mention! We want to thanks the wonderful community supporters and contributors who helped make this event a success - Allen’s, Arvest Bank, Audrey’s Resale Boutique, Bank of the Ozarks, Birdsong Gardens & Landscaping, Cedar Lodge Arkansas Resort, The Chocolate Rose, City of Bella Vista, CVS, Garden City Nursery, Harps, Macadoodles, The Potting Shed, Rose Antiques, Rozenbridge, Two25 Gallery & Wine Bar and Walgreens. Thank you!!!!!! Thank you Bella Vista! We are proud to be a part of our beautiful community! Let's have a Garden Party...Lettuce Turnip the Beet!